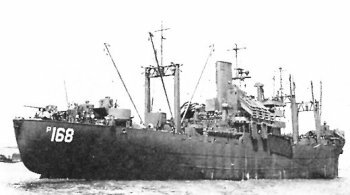 The La Salles were Maritime Commission type C2-S-B1 cargo ships converted to small transports. They were originally acquired to transport Seabees to beachheads as soon after an amphibious assault as possible. The ships were rather unsatisfactory, with cramped quarters and inadequate distilling and electrical capacity. They lacked the communications facilities and survivability needed by ships operating in the combat zone. However, assault transports were at such a premium that the ships were "temporarily" equipped with 2 LCM(3) and 6 LCVP. In effect, as one commander noted, they were "operating as ... APA[s] with AP facilities."